Sharon Freundel describes the theory and practice of tefillah in a community day school. We can only pray properly when we recognize that in fact the soul is always praying. Without stop, the soul soars and yearns for its Beloved, but it is only when we engage formally in prayer that the perpetual prayer of the soul is actually revealed. This is prayer’s pleasure and joy, its glory and beauty, like a rose opening its elegant petals towards the dew or the sun’s rays…. We, as tefillah educators, need to find the balance between developing in our children an easy comfort with the liturgical experience, the flow of the prayers, and the words of the siddur on the one hand, and challenging them with more esoteric connections and the deep embedding of prayer in their souls on the other. We are challenged to teach our non-native Hebrew speaking children the literal meaning of the words and the essential meanings behind each of the tefillot so that they are doing more than robotically reciting fixed texts. Alongside the “choreography” of the prayers – when to sit, stand, bow – and how to lead tefillot so that they become increasingly comfortable with praying at school and in the synagogue, we need to instill in them hitlahavut – enthusiasm – literally, having them light the flame within themselves, so that they are motivated, excited, and eager to daven now and in the future. And we need to figure out how to do all of this with limited time resources and in a world in which the children are used to being inundated by instant photos which quickly disappear, messages of no more than 140 characters, and sound bites? The first step is to realize that we cannot simultaneously do everything we need to do to transmit the beauty of tefillah. Just as in any other discipline, a well thought-out lesson plan needs to be created each day for tefillah: What will we pray today? What kind of kavvanah or inspiration can I share with the students today? What should we learn about a particular prayer today? The tefillah lesson needs to have a beginning, a middle, and an end as surely as does any other lesson. There needs to be a spiraling scope and sequence from the beginning of the year to the end of the year and between each academic year together with a curriculum map of content, skill, and affective aspects. Certainly, at some schools, depending on their religious approach and the ages of the students, at the minimum, shema and the amidah must be said each day. However, if all of the prayers are quickly mumbled in order to achieve the completion of Shaharit, for example, we lose the spiritual forest in pursuit of the technical fulfillment of the trees. We will create a cohort of adult Jews who may know the “how-to”s of prayer but will not connect to it in any meaningful way, nor have any desire to follow through in their obligations to pray three times a day. What follows are some projects that we have undertaken at my school, the Jewish Primary Day School of the Nation’s Capital (soon to be Milton Gottesman Jewish Day School of the Nation’s Capital) in order to enhance each student’s liturgical experience. I will lay out various projects, the thinking behind each project, and the successes and challenges to date of these numerous undertakings. בָּרוּךְ אַתָּה ה’ אֱל-ֹהֵינוּ מֶלֶךְ הָעוֹלָם שֶעָשַֹנִי יִשְֹרָאֵל. Blessed are You, Hashem our God, Ruler of the universe, who made me a Jew. בָּרוּךְ אַתָּה ה’ אֱ-לֹהֵינוּ מֶלֶךְ הָעוֹלָם שֶׁלֹּא עָשַֹנִי גּוֹי / גּוֹיָה. Blessed are You, Hashem, our God, Ruler of the universe, who has not made me another nation. בָּרוּךְ אַתָּה ה’ אֱ-לֹהֵינוּ מֶלֶךְ הָעוֹלָם שֶעָשַֹנִי בֶּן / בַּת חוֹרִין. Blessed are You, Hashem our God, Ruler of the universe, who made me a free person. בָּרוּךְ אַתָּה ה’ אֱ-לֹהֵינוּ מֶלֶךְ הָעוֹלָם שֶׁלֹּא עָשַֹנִי עָבֶד/שִׁפְחָה. Blessed are You, Hashem, our God, Ruler of the universe, who has not made me a slave. בָּרוּךְ אַתָּה ה’ אֱ-לֹהֵינוּ מֶלֶךְ הָעוֹלָם שֶעָשַֹנִי בְּצַלְמוֹ. Blessed are You, Hashem, our God, Ruler of the universe, who has not made me a woman / who made me in the Divine Will. We teach both of the versions, explaining the thinking behind each one, and then instruct the children to discuss with their parents which version they should recite. In addition to various denominational prayers, the hard-cover siddur is coded according to section of tefillah, and includes fullcolor pictures and commentaries by the children and the faculty in order to make it more interesting, inspiring, and child-centered. The layout of the siddur reflects the poetic nature of many of the tefillot and our original translation are child-friendly. To reflect the desires of a significant part of our demographic, the siddur uses gender neutral God nouns and pronouns. All of the children received their own siddur personalized so that they have a sense ownership and responsibility for their own holy sefer. Since the acquisition of their new siddurim, the children have taken tefillah much more seriously. They follow along better in the siddur, can navigate the siddur more efficiently, and participate more fully. They are also much more respectful of the physical entity of the siddur, as they have come to value this personal, treasured commodity. Since tunes for the tefillot vary between synagogues we slowly introduce new tunes for various tefillot. This not only allows the students to be comfortable in multiple synagogues, it introduces variety into the tefillah experience in school, both so that, when students attend synagogues, their own and others, they can recognize the tefillot, and to “mix it up” and make tefillah more varied and therefore more engaging. All of the tunes we teach are recorded and stored in an MP3 folder on our school server, so that any new tefillah teacher can familiarize him or herself with the tunes and so that students can have ready access to them. On occasion, the students themselves can decide which tune we will use. This has created significantly more engagement, as the students have a voice in what we will do that day and belt out their favorite tunes enthusiastically. One day per week, we teach be’ur tefillah, so that the students can learn the structure of tefillah in general, understand the meaning of the words that they are saying, and connect in a personal way to their prayers. The template of the worksheets is based on the template of the prayers in the siddur we created, so that the children are already familiar with the “look” of the pages. Each amidah lesson, for example, follows the same format, with the students exploring how we refer to Hashem in that berakhah, what we are asking for, and how we relate personally to that berakhah. This ברכה is part of a larger תפילה called: Circle the correct answer. Why do you think this ברכה is part of the עמידה ? Why are we asking ‘ ה for this? We have found that the children deeply engage with the didactic lessons and in the ensuing discussions. We have not yet developed an assessment to weigh the correlation between this aspect of their tefillah education and their engagement in the actual tefillah. Children in the 21st century Western world need to find paths in which to connect liturgically to God in ways additional to normative tefillah. They will derive more meaning from the prayer by experiencing tefillah through a medium that resonates with them. For the last two years, we have piloted tefillah electives, wherein one day a week, the students explore prayer outside of the regular pathways. They have had such choices as Art, in which they create paintings reflecting their emotions and views of various tefillot after researching what that tefillah is all about; Writing, in which they compose their own personal tefillot to Hashem; God Talk, in which those children with burning theological questions explore their issues in dialogue with a teacher and maintain a blog with their discussions; Kavvanot in which they unwrap and discuss inspiring videos, quotes, and songs related to spiritual experience and tefillah; Deep Dive in which the students explore the history and background of selected tefilot; and Tefillah Etiquette, in which they study the traditions surrounding proper decorum, posture, and environment during tefillah. At the end of each one-semester elective, the students prepare exhibits for a “tefillah museum,” which all of the students tour to investigate the other students’ work in tefillah. This project has met with much success, motivating the students to create something truly meaningful and worthy of presentation and, as with all programs and curricula, we are still in the process of revising and improving it. Almost five years ago, we convened the first tefillah committees. These committees are arranged by grade, are an opt-in activity, and meet once a week during lunchtime. The thinking is that if the children are actively involved and enfranchised in improving their own tefillah experience, it will make the practice all the more meaningful to them. The committees generally have 10- 12 members each, an easily manageable but significant size. The committees have undertaken among other things, such projects as designing a new parokhet for our aron kodesh, refurbishing another aron kodesh, creating a tefillah slide show with inspiring pictures relevant to the theme of each tefillah together with the page numbers, and rethinking and redesigning the tefillah space that we use in the absence of a Beit Midrash. The children were so motivated by their own slide show creation that they created a Birkat Hamazon slide show for “the younger students who can’t yet read and so they don’t know what they’re saying, and this will help them know what each berakhah is about.” The tefillah committees have been highly successful as one of the rules is “60% work; 40% fun.” Because the students are immersed in projects which they have decided to undertake and because these projects are structured to be creative, they are very enthusiastic and have seen multiple projects through from beginning to end, creating a sense of accomplishment and ownership. All of this is not to say that tefillah is not still challenging. We still have children who space out, who consciously refuse to pray, or who find excuses to leave the room for long stretches. 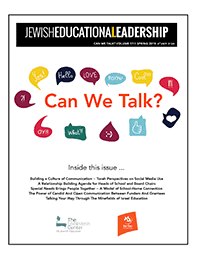 We still worry on a continual basis about what the long-term effects of our tefillah curriculum will be, a curriculum that is still too new to conduct a valid, reliable longitudinal study on. 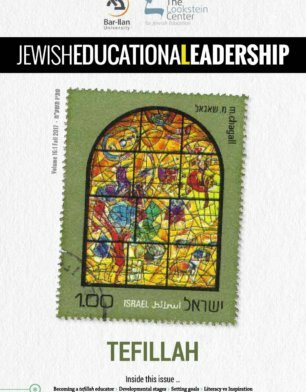 We still encounter disagreements among staff members who have varied approaches to and thoughts about the best way to teach tefillah. In Orot Hakodesh (Vol. III, p. 227), Rav Kook writes: “People may abandon prayer because they envision a perfect prayer, a brightly radiant prayer.” We need to assure that our children never abandon prayer, while providing them with opportunities to draw closer to “brightly radiant prayer.” It is a noble enterprise, one which is difficult and at the same time, supremely worthwhile. Sharon Freundel is Director of Jewish Life at Jewish Primary Day School of the Nation’s Capital. Formerly a nurse specializing in Pediatric ICU, she has played key roles in informal and formal Jewish education for more than three decades.